I really hoped this recipe would be revelatory – one of those rare gems that requires few ingredients, little work, and yields ace results. 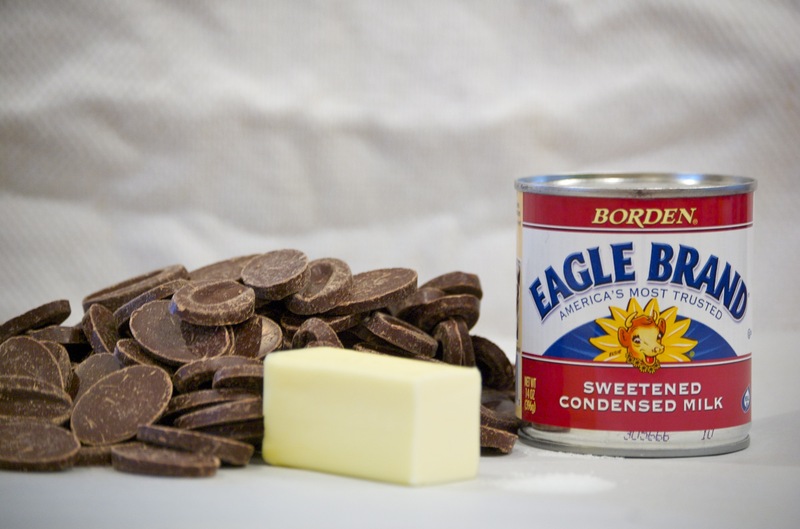 The New York Times offered this up as an example of the utility of sweetened condensed milk, and promised “Absurdly Easy Fudge.” It didn’t lie – it was absurdly easy: a can of the milk, a pound of chocolate, some butter. It sounded as though it could only be as bad as the chocolate in it, and so I splurged and used Valrhona bittersweet. I mixed the components together over low heat, put it in the pan and then in the refrigerator, and waited for the creamy, chocolaty goodness that I associate with good fudge. What I ended up with (above) was a layer of grainy, chewy chocolate covered in a layer of re-hardened melted butter. I don’t know if I should have used chocolate chips (which have stabilizers in them) or if I should have cut the butter pieces smaller or if the recipe is just not that good. I sampled it, and it does taste like good chocolate – but it feels bad in my mouth. My sister-in-law, who’s in to wrangle The Lad and Lass for the weekend, concurred. Luckily, both of us like chocolate enough to eat just enough of this stuff to make it worth the investment. I’m chalking this up to a lesson in reading between the lines. After all, the title was not “Absurdly Easy and Delicious Fudge” – just Absurdly Easy. And that it was. So, if you want to give it a shot and see if you get different results, here’s the recipe. If you do end up with something absurdly easy and delicious, please let me know! Which reminds me … my aunt makes a great fudge that uses marshmallow Fluff … I’ll see if I can track that down and see if that’s closer to what I’m looking for. Stay tuned. Line an 8-inch-square baking pan with overlapping parchment or wax paper, letting edges of paper hang over sides of pan. Combine all ingredients in a large, microwave-safe bowl. Microwave on low power to melt ingredients, stopping every 10 to 20 seconds to mix well. The mixture should be heated as little as possible. Scrape mixture into prepared pan and spread into an even layer. Refrigerate until set, about 4 hours or overnight. 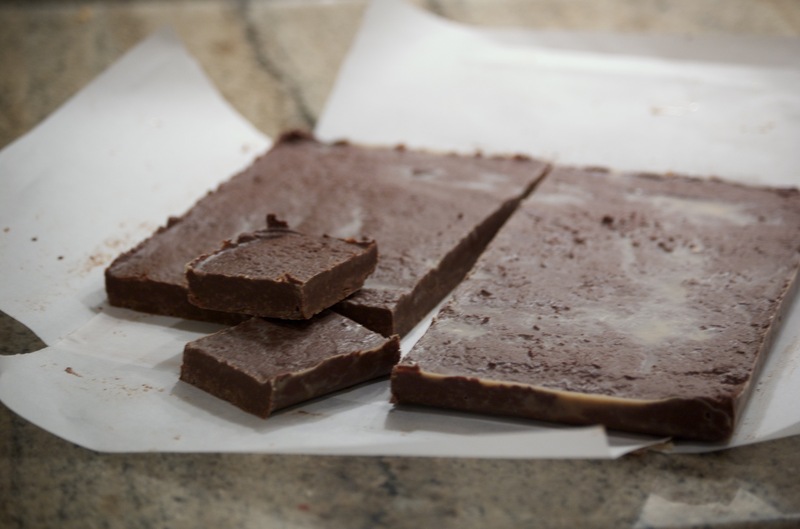 Lift fudge on paper out of pan and use a large knife to cut into squares. Oooh, I like that you can be honest with us when something doesn’t work out. I still admire all your experimentation. It will be worth a try with the grandchildren at the beach this summer. They’ll think it’s delicious no matter what! For the record, I tried this again with chocolate chips, and encountered the same problem. Fail, again.